More than 100 years ago, Mark Twain wrote about the Jews and asked: “All things are mortal but the Jew; all other forces pass, but he remains. What is the secret of his immortality? In this seminal book, David Ben Moshe goes beyond generalities to describe how the Jews have re-established a Jewish State in an area coveted by every major power throughout history. Friedrich Nietzsche is as often misunderstood as the Jews. 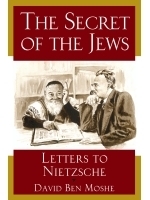 Ben Moshe highlights Nietzsches admiration for the Jews of the Bible, and looks into the remarkable similarity between many of Nietzsche's writings and Jewish sacred texts. After getting into this book, I showed it to a couple people. Three people, three reactions (a little under par- youd expect four opinions from three Jews). These letters were a delight for me, an escorted stroll through the back alleys of history. It illuminated little-known relationships (and almost relationships) between important figures in different worlds that arent often studied in the same context (e.g., secular philosophy or psychology and Torah law). Someone else I showed it to asked, Who cares? Indeed, it is a valid question for some to ask of such an esoteric topic as this, but ultimately, this is an important book in its depiction of the dawn of the modern (Modern?) Jewish identity and different attitudes towards historiography. This book will not have a wide audience, but I suspect it will have a deep one.